Our approach to the treatment and management of migraine headaches yield very rewarding results that have encouraged me to reevaluate scientific literature over the past fifty years. 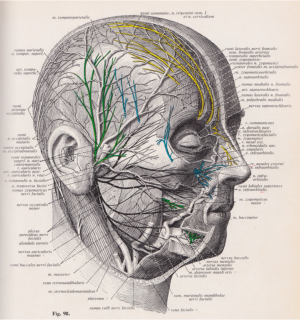 I went back to once again study the very basic knowledge of the morphology, anatomy, and physiology of the trigeminal Nerve per se, and autonomous nerve system. The key question is how is how does my simple approach bring a longer period of relief when compared to the various more complex treatment approaches that exist today? Migraine headaches are defined by an episodic neurovascular disorder characterized by recurrent unilateral headaches accompanied by numerous autonomic symptoms in its variety of intensity. Current theories suggest that the initiation of a migraine attack involves a primary event in the central nervous system (CNS), probably involving a combination of genetic changes in ion channels and environmental changes, which render the individual more sensitive to environmental factors; this may, in turn, result in a wave of cortical spreading when the attack is initiated. However, most of these suggestions lack genetic studies of the hypothesis. The very exact pathogenesis of migraine headaches remains unknown and still remains to be doubtlessly understood in the beginning of the 21st century. Factors such as bright lights and ultraviolet waves, flickering lights, as well as certain visual patterns, smells, noises, tastes may trigger migraine. All expressive factors of physical environment. Life style stressors can also trigger a migraine attack, and it has been hypothesized that visual cortical hyperexcitability can be responsible for migraines too. Migraines are a common and potentially serious chronic, disabling disease. The prevalence of migraines in the U.S. adult population is roughly 80% among women and 20% among men. For these reasons, it is imperative for primary health care professionals to understand and treat migraines as a potentially burdensome and chronic disease. Yet, ironically, epidemiological studies show that about 50% of patients seeking medical consultation for migraines are not being diagnosed, regardless of the reported impact and severity of the disorder due lack of provider’s education in headache. The pattern of disorder consequently demonstrates depression, anxiety, generalized phobias, and other nonspecific mood disorders may add to an individual’s disorder during the period of chronicity of migraine headaches. On the other hand, this is not proven to be objective and universal. It remains only on the basis of hypothesis. With the broad range of manifestations, the dynamic of migraine attacks gave rise to plenty of scientific and nonscientific cause theories and hypotheses. It is important to note that most of them have yet to be scientifically proven. In order to understand our empiric treatment and satisfactory long term results I was determined to reevaluate the theories, hypotheses, and laboratory research results from involved medical investigators within migraine headache literature. I made an outright effort for my research to be objective and critical. I was able to proceed with studies in the field of vascular physiology and molecular biology of cell. Trigeminal nerve (TN), Greater Occipital nerve (GON), and all the peripheral nerves system in all vertebrate species are physiologically under the control of the sympathetic and parasympathetic nerve systems. The peripheral and central vascular systems are influenced to a higher degree by autonomous nerves. A profound organic understanding of this system provides a closer understanding of autonomous nerve disorder. The autonomous nerve system is an independent, self-managed, and self-controlled system that serves as a complex multifunctional internal system of organs. Its function continues even when the cognitive cerebral centers are out of function e.g. in brain death. The autonomous nerve system demonstrates the dual functions of pro and contra functioning systems called the sympathetic and parasympathetic “nervous system”. Their activities may affect human and animal emotions and vice versa. The diffuse and broad bands network of sympathetic and parasympathetic nerve fibers therefore, make it impossible for surgeons to have a complete and successful sympathectomy, or even neurectomy. The painful malfunctions return after a period of time. Reflecting the complexity of understanding and decoding the interconnections of “rami Communicants” seems extremely challenging when it comes to Neurophysiology. Both the sympathetic and parasympathetic nervous systems are highly functional independent systems that naturally exist to balance one another. Physiologically, there are switching systems that genetically determine the silencing or desilencing of the sympathetic and parasympathetic nerves upon positive or negative impulse. For example, nerves innervating the dilator pupillary muscle are sympathetic, and nerves innervating the pupillary sphincter muscle are parasympathetic. Autonomous nerve system responds to overtly damaging stimuli from our physical and chemical environment, although this system responds to vigorously to stimuli that are threatening. Process of pain in all species is a complex hierarchical complex process. This process starts with vasoconstriction, which results in hypoxia/anoxia (called ischemia), and production of the cytokines, pro-inflammatory and neuro-inflammatory toxins locally at the cell basis peri-neural blood vessels not nerve cells. Ischemia induces tissue damage and changes in the cell biology, which if not interrupted, may cause cell death and permanent damage. Pain, a major subjective protective system in our DNA, manifests the strong possible signaling system. Repetitive ischemic events of the nerve cells in neuralgias of craniofacial pain defining dysbalance between ischemia and oxygenation status of the cell cycle where neither of either condition could get the upper hand and the final triumph. Each ischemic event follows by reactive vasodilation response which is predilected by synthesis of Calcitonin Gene Related peptide (CGRP), and substance p (SP) in a spillover phenomenon to end hypoxia. Receptors of CGRP have been identified in the endothelial lager, media and intima of resistance vessels. Whereas, Substance P (NK1) receptors are expressed by endothelial cells. (1). Vasoconstriction, a safety warning action proceeds vasodilation, Vasodilation, a status of safety bypasses vasoconstriction and to end status of hypoxia. Pro-inflammatory and neuro-inflammatory cytokines respectively increased only in status of vas- constriction, while CGRP and SP increased in serum only in status of vasodilation. Migraine headaches seem to demonstrate a dysbalance between sympathetic and parasympathetic innervations of the cerebrovascular system rather than a central cortical cause. As well-known all tissue and organs in vertebrate are nourished with arteries and veins, which penetrate in different caliber and function into the tissue and cell. However, this vascular system is controlled by sympathetic and parasympathetic nerve system to provide controlled equibbrial balance in a complex creator called life. Brain is complicated hardware programmed by its five sensory organs connecting it to physical environment. Through those sensory organs brain get with passing of time programmed to the laws of physical world such as light, different rays length, their hazardous effect . Perception of those effects programming the centers of the brain. Now, any abnormal and hazardous impulse damaging or incapacitating the specific hardware for brain programing in this case eyes may deprive visual cortex from its capacity. For instance a blind individual may not be able to experience visual dream because of lack of visual reception of his/her physical environment. The same could be accepted upon other four sensory organs. Brain without its sensory organs is similar to a computer hardware without useful program. Sensory organs without a function brain are useless programing tools. The role of the sensory organs are not only to secure the programmed and highly functional brain, but also continue the completing the programing with unlimited capacity. Giga bite capacity of the human brain speculated indefinite. Pain is the best and the only messenger of the upcoming dangerous and damaging condition to any of the peripheral sensory organs. This phenomenon embedded in the sympathetic part of the autonomous nerve system covering vascularity of the peripheral nerve. Every physical stimulus has to enter through the sensory organs before it reaches the brain centers. No exception. The role of the sensory organs here speculated as safety gate for healthy functionality of brain. Pain per se is peripheral and locally determined, acknowledged by brain in pattern of perceptive logic to handle the continuation of life. To be able to experience all type of pain human need to have intact and functional fie sensory organs. Perception of pain is a learning process , it is not intuitive capacity. Migraine, a complex phenomenon of painful debilitating condition continues unless sympathetic status down regulated in the either sensory organ. It is our understanding that upregulation of sympathetic nerves in any of the five sensory organs at the time of the initial hazardous attack at certain time and environmental environment. Any close and similar physical stimulus at any time may stimulate the upregulated nerve. We speculate that genetic cause of pain and migraine per se located in any of the sensory organs may correspond to the certain organs defective or insufficient capacity of the genomic in the family tree. We speculate that all type of headaches except for anatomical morphological pathological brain growth related are sensory organ and therefore peripheral disorder. Our treatment plan includes a one session treatment with rewarding results. The therapy starts with an introductory evaluation of the patient’s medical records, medications, history, and special pain behavior. Patients with chronic or periodic trigeminal neuralgia or craniofacial neuralgia, including cluster headaches are then selected after being educated about the treatment. All medications taken for migraine will be discontinued at the time of consultation. Before the treatment, individuals will return to the clinic for necessary tests (if any required). After the initial treatment, patients will return if any symptoms of pain continue or recur within the next 72 hours. They will immediately receive the treatment for the additionally affected nerve branch which may take over 30 minutes. We request that patients temporarily put a halt to medications such as Plavix, Coumadin, aspirin, fish oil, and vitamin E a few days prior to the treatment. Other medications should be continued. We utilize a sophisticated combo of dexamethasone, lidocaine and highly neuropotent B vitamin which being injected in to the branches of the trigeminal and occipital nerves bilaterally at the same time. The De-Novo compound prepared in sterile fashion and administered meticulously in minimal portions using a very thin needle. No premedication or intravenous access is necessary. There is no down time involved with the treatment. Patients may return to daily activities the very same day. An innovative treatment that truly allows you or your child to return to normal daily life, school or work. Skeptical patients preferred for treatment, it is your good right to be skeptic after many treatment and promises. We do not promise we treat. Would you like to learn new and effective chronic migraine treatments? Call us at 888-377-8444. We can offer you advice and solutions when it comes to Innovative Treatments for Migraines in Corona, California.